Microblading is a semi permanent eyebrow enhancement treatment, where colour pigments are inserted with a tiny blade to recreate natural looking eyebrow hair strokes adding extra thickness, shape, definition and lift to the existing brow shape. Brows play an important part in creating your facial expression. Lack of definition, thinning through ageing process or over plucking, alopecia through illness, chemo therapy and stress, have changed our eye and brow shape. Microblading is able to re- create a new eye brow shape that suits your face shape and adds thickness and expression to you. It is wonderful for sports people and is a great make up base by creating a natural eye lift. After your initial consultation we start by drawing the desired eyebrow shape. 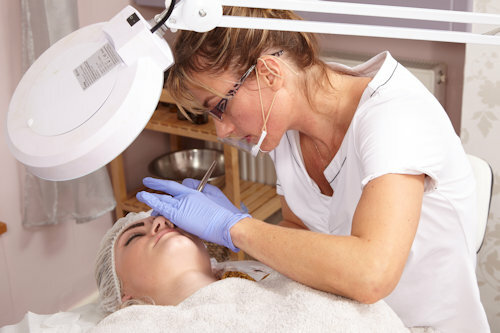 Numbing cream is applied and the Microblading Artist starts to add fine hair strokes in the top layer of your skin. This is a relaxing and enjoyable experience as the work is carried out very gently and precisely to achieve a beautiful and natural look. The treatment time is about 2 hours and your beauty clinic will discuss the after care and your second repeat treatment with you. Usually 6-8 weeks after. After the healing process 60-80% of the used pigment will remain in the skin and can last between 18 month to 3 years. This depends on the individual skin, and exposure to the sun and after care.